Programe priority: 1. „Protection and development of the natural and cultural heritage of the border area”. The aim of the project is to digitize 3D selected historical landmarks of the Polish-Slovak border. Developed 3D models will serve as a way of archiving historical buildings. The task of the project is also to exchange know-how on the digitization of monuments, to train cultural workers on modern tools used to protect and promote cultural heritage and to create innovative tourism products. The project is co-financed by the European Union from the European Regional Development Fund. Program Program Interreg V-A Polska-Słowacja 2014-2020. On May 19 2017, the Podkarpackie voivodship in Rzeszow, the Pillar Hall, celebrated the signing of contracts to finance Interreg PL - SK 2014-2020 projects. Contracts were signed between the Ministry of Development of the Republic of Poland and successful applicants. 4 contracts have been signed. As part of the ceremony, a signed contract for the financing of the TRITA EGTC project was signed with a partner at the University of Žilina, Žilina, entitled: Joint 3D digitization of historical objects of the cross-border territory SK-PL. The treaty was signed by Mr Adam Hamryszczak and TRITSA Director Marta Sláviková. The implementation of this project began on 1.4.2017. On May 19, 2017, the Podkarpackie voivodship in Rzeszow, the Pillar Hall, celebrated the signing of contracts to finance Interreg PL - SK 2014-2020 projects. 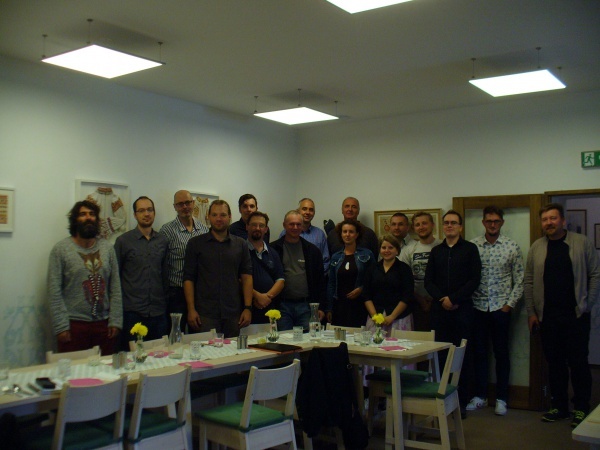 There was 5.9.2017 work meeting of the project on the one of the place, which are included between project managed objects – Slovak village Čičmany. There was meeting of management and technical expert of the project. Ing. Milan Boršč (member of the team UNIZA), Ing. Tomáš Cesnek (member of the team UNIZA), Ing. Brita Endersová (manager, member of the team UNIZA), Ing. Patrik Hrkút, PhD. (member of the team UNIZA), doc. Ing. Miroslav Hrnčiar, PhD. (main manager of the project UNIZA), Ing. Jakub Chromčák(member of the team UNIZA), Maximilian Kormaňák (expert for film), Ing. arch. Peter Krušinský, PhD. (member of the team UNIZA), doc. Ing. Milan Kubina, PhD. (member of the team UNIZA), Ing. Michal Lekýr, PhD. (member of the team UNIZA), Ing. Matej Meško, PhD. (member of the team UNIZA), Ing. Peter Pisca, PhD. (member of the team UNIZA), Marta Sláviková (director EGTC TRITIA), Ing. Filip Škultéty, PhD. (member of the team UNIZA), Ing. Peter Tarábek, PhD. (member of the team UNIZA), Ing. Štefan Toth, PhD. (member of the team UNIZA). The aim of the meeting was to get common information about realization of the project for next time and consultation of project questions.